A year has passed since Hurricane Maria first made landfall in Puerto Rico, destroying homes, roads and vehicles in its path—and taking thousands of lives. The island languished for months as an insufficient emergency response campaign attempted to restore basic services like water and power. After a recent independent study, the official death toll was raised from the initial 64 to 2,975; analysis done by The New York Times, citing malnutrition and other food-based ailments as possible culprits for surging mortality in the storm’s aftermath, estimated that number could be more than 4,000. How could this happen? By taking out the island’s infrastructure like highways, trucks, gas stations and more, the storm also wiped out its agricultural supply lines. Puerto Rico imports about 85 percent of all its food, producing just 15 percent of what’s consumed on the island. In the wake of the storm, people stood in lines for hours and walked barely-stocked aisles looking for canned, non-perishable foods. Many relied on emergency responders and Federal Emergency Management Administration (FEMA) meals, made of packaged and processed foods that require little to no preparation, like the beef jerky and crackers you’d expect to find in a vending machine. In harder-to-service rural areas on the island, the threat of starvation loomed large. The story of Puerto Rico’s food production is also the story of the island’s own colonial history. Large-scale plantations replaced native farming during Puerto Rico’s days as a Spanish colony, resulting in the consolidation of agricultural land and landholding, as well as the number of crops being grown on it. When the U.S. took over the island in the wake of the Spanish-American War in 1898, economic restructuring meant that the remaining agricultural activity focused only on cash crops like sugarcane and coffee. “Puerto Rico’s economy has always been categorized by being an import economy: we produce things we do not consume but then we have to import things we do consume, especially in agriculture,” noted Gladys González-Martínez, a professor of agricultural economics at the University of Puerto Rico. Still, Puerto Rican local farming had been experiencing the beginning stages of a renaissance even before the storm hit, spurred by the economic crisis of 2006. According to statistics provided by the governor’s office, farm income grew 25 percent from 2012 to 2014, while the number of acres under cultivation rose by 50 percent between 2012 and 2016, generating at least 7,000 jobs. That progress was short-lived: 80 percent of the island’s crops were destroyed in the storm. But, despite those losses, the seeds of a local agricultural had taken root. Some took the storm as inspiration. At farms like Cosechas Tierra Viva in Las Piedras, run by Eduardo Burgos and Franco Marcano, where they grow kale, arugula, green beans and eggplant for local farmers markets, the storm kicked them into high gear. 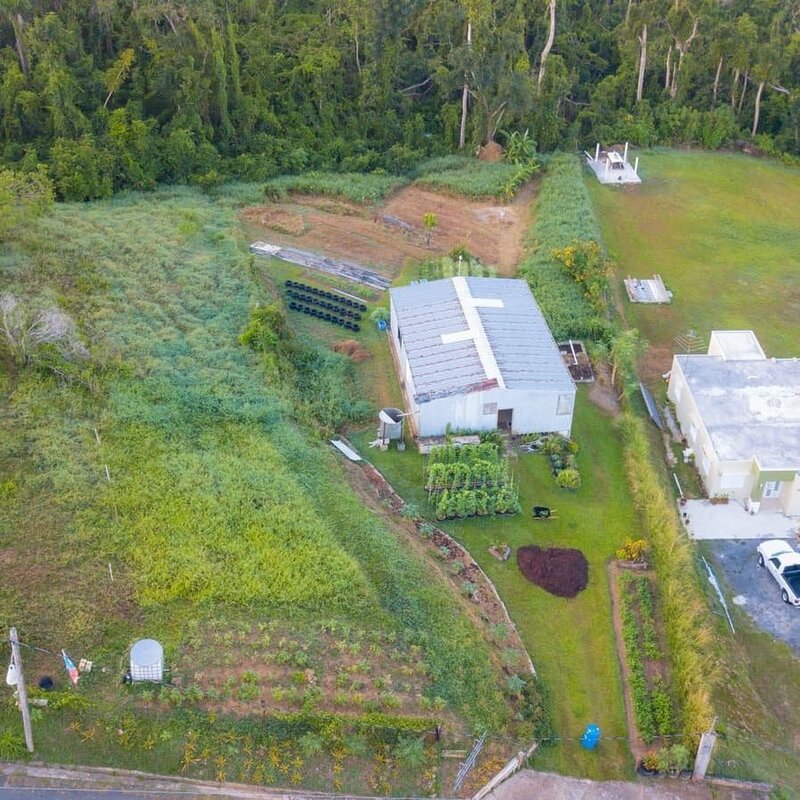 Just a month after Maria’s landfall, they converted the farm to run exclusively on solar energy and shifted their irrigation system’s source to rainwater. “Maria was the push we needed to execute the ideas we had to expand our production,” Burgos told NBC News in July. They’re not alone. 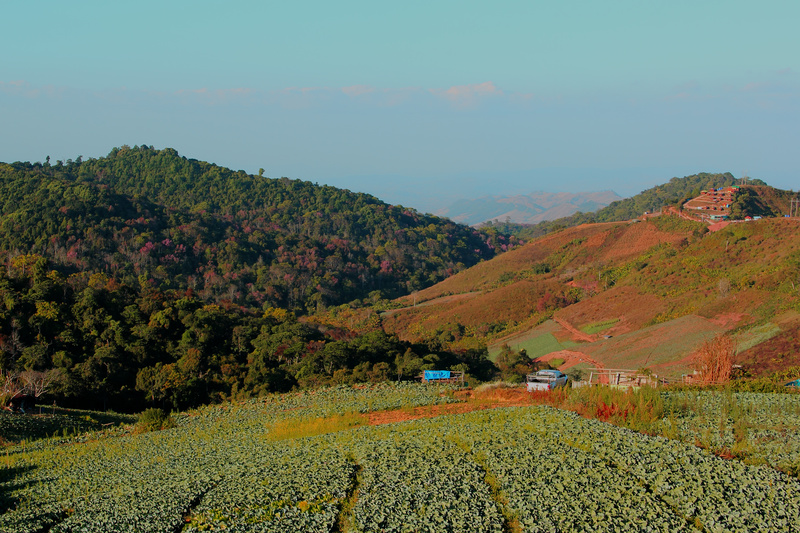 Agroecology—defined by the Food and Agriculture Organization of the United Nations as both a movement and practice of socially, economically, and environmentally sustainable development—is an approach to farming that promotes diversity through crop rotation, polycultures, or livestock integration, and uses natural systems and local knowledge like planting flowers to attract insects that keep pest levels under control. Using agroecology has allowed Puerto Rican farmers to envisage an agriculture system not reliant on external inputs from chemical companies and fossil fuels. And the idea is rapidly taking hold in farms, schools and community groups across the island. Already, organizations like the Puerto Rico Resilience Fund are supporting the movement by establishing sites like the student-run farm at the University of Puerto Rico’s Río Piedras campus, while networks like the Organización Boricuá de Agricultura Ecológica de Puerto Rico are helping small farms like the Pachamama Bosque Jardín find their feet. These projects are crucial for the island’s food security, but also for its protection from storms that are likely to grow in intensity and frequency due to climate change. Surveys after hurricanes in the late 1990s in countries like Nicaragua and Cuba have shown that diversified, small-scale farms suffer less damage than bigger farms practicing conventional agriculture. Already, the movement is making a noticeable difference. The Puerto Rican Department of Agriculture is aimingto have food imports down to 65 to 75 percent by the end of the year, which could represent as much as a 20 percent decrease on pre-Maria levels and a 30 percent drop from the island’s post-Maria peak. Ricardo Fernandez, CEO of Puerto Rico Farm Credit, sees signs of the transformation. People are flocking to farmers markets; university students are signing up for agricultural classes. “There’s a resurgence now, because we have to re-invent ourselves,” he says in a recent interview with NPR. For an island facing serious questions about its own colonial legacy and territorial status, local food may well be the first step towards a more independent Puerto Rico.
? David Attenborough: ‘Population Growth Must Come to an End’ Dog Steals GoPro Camera And Records “Perfect” Footage ?